APA Group and Hastings Diversified Utilities Fund (HDF) have issued differing shareholder return claims for HDF as part of their manoeurvering around APA's takeover offer. Among other claims, APA's Second Supplementary Bidder's Statement says that HDF does not accurately portray the performance of HDF relative to APA Group and the relevant benchmark. HDF had claimed that its securities had outperformed APA's securities since HDF listed in December 2004. But APA has responded that the adjustments HDF's Responsible Entity made to the calculation of the index and the returns of APA Group and HDF are incorrect representations of those items". GWA Group said its results for the half year to December 2011 will that show that revenue and trading earnings (EBIT) are in line with previous guidance. Revenue was slightly down on the 2010-11 half last year and EBIT is in the $44 million to $46 million range. An underlying decline in revenue of 11 per cent was offset by revenue from Gliderol, which was acquired in January 2011. Revenue was impacted by lower sales of environmental water heating products in the Dux business, the absence of government stimulus spending and the downturn in building and renovation activity. Net profit after tax will be impacted by restructuring costs and discontinued operations. Each of these items will have a loss after tax in the range of $7 million to $8 million. The discontinued operations are the sale of Sebel in September 2011, and sale of the Caroma North American business in December. The latter saw working capital and business activities transferred to GWA's North American distributor, Sustainable Solutions International. Restructuring of local manufacturing saw total employees reduced by 7 per cent in the last six months. This included the wind back of the Caroma Wetherill Park operations to one shift and the closure of the Gainsborough door furniture factories in Blackburn and Kyneton. GWA said it is continuing to work with potential buyers of non-core properties but no agreements have been reached and a decision will be made in the current half year whether selling the properties is in the best interests of shareholders. Securities in Hastings Diversified Utilities Fund hit a three year high of $2.10 on 3 February. APA Group has issued a Second Supplementary Bidder's Statement that says that HDF did not accurately portray the performance of HDF relative to APA Group and the relevant benchmark. HDF had claimed that its securities had outperformed APA's securities since HDF listed in December 2004. But APA responded that the adjustments HDF's Responsible Entity made to the calculation of the index and the returns of APA Group and HDF are incorrect representations of those items". CBD Energy saw a decline in December quarter revenue which came in at $14.8 million. Revenue for the half year was $52.9 million. Net operating cash flows were minus $7.5 million for the quarter and minus $11.9 million for the half. Cash was $2.7 million. The company said that in October 2011 it entered a RECS financing arrangement where it draws down funds against RECS it holds. This allows it to release cash without having to sell the RECS on market at prices below its target price. In the December quarter it realized $7 million under the arrangement. "In line with accounting standards, these cash inflows are treated as financing cash flow despite being derived from operating activities until such point the RECS are actually sold. Had the company sold these RECS on market instead, the operating cash inflows for the quarter would have been increased by a minimum $7.0 million resulting in net operating outflows of negative $0.6 million," it said. The company has continued this source of funding post 31 December. The funds are to grow its pipeline of international and domestic solar and wind projects and its commitments to the AusChina Joint Venture. However, long lead times mean these projects will not contribute to operating inflows until future periods. Shares in Clean TeQ Holdings doubled to a one year high of 8.7 cents on news that it has established a joint venture with Tokyo based Nippon Gas Co to provide water desalination facilities and services in the coal seam gas industry. Nippon Gas will invest $4 million in the 50-50 joint venture, Associated Water Pty Ltd, which will use Clean TeQ's Continuous Ionic Filtration (CIF) technology for the desalination processes. Clean TeQ will also provide administration and engineering services to Associated Water in its first years of operation. Listed on the Tokyo Stock Exchange, Nippon Gas manufactures liquefied petroleum gas, utility gas and gas-related equipment. It has revenue of $1.2 billion and 975,000 customers. Clean TeQ said the Australian coal seam gas water market has the potential to be one of the largest emerging water treatment market opportunities globally. "The rapid expansion in exploration and development of coal seam gas fields has led to an urgent need for new and cost effective water treatment solutions with an emphasis on the minimization of the environmental legacy of by-product brine streams." Expenditure on water treatment by the coal seam gas market is estimated at around $300 million to $500 million per annum. Similarly, treatment plant operating costs are estimated at around $500 million per annum at peak production and will continue to about 2030, the expected life of the gas fields. Major coal seam gas companies in Queensland and New South Wales are expected to develop 20,000 to 30,000 coal seam gas wells. Clean TeQ commenced development of its patented CIF technology in 2004, aiming for a simple and cost effective desalination technology that could operate reliably with water that has a high fouling and scaling potential. The technology won a Federal Government Climate Ready Grant and a Western Australian Premier's Water Grant. CIF will be used alone or in conjunction with reverse osmosis and evaporation technology. A typical operation can recover over 90 per cent of the water as clean water useable for agriculture, livestock, industry or for return to the environment. Clean TeQ said conventional approaches typically deliver less than 80 per cent water recovery and involve significantly high cost managing the 20 per cent plus brine by-product stream. Associated Water's expects to provide a lower cost solution than is currently available to the industry. Clean TeQ chief executive, Peter Voigt, said "This venture places a value on a small part only of the extensive IP portfolio that has been developed by Clean TeQ over the past decade for both water and mining applications. The next stage of the commercialization pathway is to extend the reach of our IP and technologies into other markets, both vertical and geographic." CO2 Group said the number of landholders investigating carbon sink opportunities with CO2 Australia has increased 681 per cent since the introduction of the Federal Government's Carbon Farming Initiative (CFI) in August 2011. "Over the last six months, we've seen a massive increase in the number of farmers asking about establishing carbon sinks on their farms," said CO2 Australia land acquisition manager, Mark Ritchie. "This high level of interest is very positive for Australia's growing carbon industry and also indicates that landholders understand how carbon sinks can enhance farm productivity and improve the landscape." As well as the financial benefits landholders receive, carbon sinks provide shelter belts for livestock, and reduce waterlogging, salinity and wind erosion. "CO2 Australia-managed tree plantings have contributed enormously to livestock production including lambing. The shocks and stresses of the hot and cold weather to sheep and cattle can cause mortalities, but a farmer near Dubbo, NSW, was shearing his sheep when it was pretty cold in October and he didn't lose any sheep due to the shelter provided by the trees," said Mr Ritchie. Mallee trees have a long lifespan and are fire tolerant. They will regrow after a fire, so any loss of carbon is temporary, he said. Greencap said the sale of its testing business Leeder has allowed it to repay $8 million of core debt, leaving it with a working capital facility of $5.5 million, which it will maintain to fund growth. The company said it has encountered the same difficult trading conditions as in the general economy leading to project delays and lower than expected activities in the second quarter. Greencap's earnings expectation on continuing operations for the half is less than last year but within 10 per cent. The company said it remains confident it will continue to build its risk management consulting business. Recently, the company has won new projects in property and environmental risk management, many of which are required to be completed within this financial year. For example, agribusiness Landmark awarded Greencap several projects covering SOX reporting requirements around property and environmental risk management around Australia. The million dollar projects are required to be completed in 2012. Spotless Services recently engaged Greencap's South Australian and Northern Territory offices to conduct asbestos inspections for its sites in NT, SA and WA. Some international facilities have been added to the portfolio, and the project value is about $1.2 million with work expected to be completed by March. Other works recently awarded include $200,000 of environmental assessments at three Toxfree waste management facilities, and involvement in the remediation and management of the recent Katherine derailment accident on behalf of McMahon Services. The Perth office has been contracted to provide sustainability services to the WA Government water utility over the next 12 months. The work involves influencing public consumer behaviour to save water in locations throughout WA. Revenue during 2012 will be over $3 million. Hydromet Corporation has entered an option agreement to sell its interest in the Stanton Mining Lease in the NT. This has copper, cobalt and nickel mineralization. The price is $2 million payable in listed public company vendor shares. The option is exercisable before 31 October 2012. Hydromet said that subject to regulatory approvals it intends to distribute the vendor shares as bonus in specie to shareholders when the option is exercised. The move is positive as selling the lease would improve Hydromet's focus on its environmental activities. In its used battery recycling operations, Hydromet has concluded a sales agreement for 50 per cent of its lead product output at improved terms for the second half of the financial year. Along with the saving from freight charges, the improved terms will lift gross margin by 6 per cent. "With strong demand of our lead products by our smelter customers, we will continue to negotiate with them with the objective to improve our terms of sales and gross margin," it said. Simon Henry has increased his interest in Hydromet Corporation from 12 to 13 per cent. (ASX: HMC). Solco said its unaudited results for the December half are revenue of $11.6 million and a loss before tax of $3.8 million. Full year revenue is forecast at $32 million. The company said it is debt free status and has a strong balance sheet. The result is due to a downturn in the residential solar energy market. 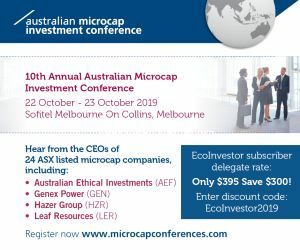 Solco said the downturn needs to be viewed in the context of the record 2010-11 year for the solar energy sector, which saw 700 MW installed in Australia due to State Government rebates and Solco had a record turnover of $52 million and profit of $3.5 million. Solco said it is aggressively adjusting its business to capitalize on a post-rebate environment in which residential demand is cautious, while opportunities for commercial solar power are increasing. Key actions have included substantially reducing inventory and monthly overheads, the full benefits of which will be seen in the full year results. The resulting stock writedowns contributed $2.5 million of the company's loss for the half-year. The commercial power projects division saw work increase from $250,000 in the first half to $1.7 million for the second half. Solco said it retains a positive outlook on the long-term solar energy market in Australia. "The company believes it is highly likely that the goal of price parity for residential and small-to-medium commercial customers with traditional energy sources has recently been achieved as a result of the fall in panel prices. The company believes that price parity will gradually encourage stronger residential demand as consumers seek to secure long-term control over their power costs." Price parity will also encourage more commercial scale projects, where Solco has growth with a strong pipeline of work and has secured or is finalizing contracts to install systems in Victoria and Western Australia. Ceramic Fuel Cells has welcomed confirmation by UK Minister of State (Climate Change), Greg Barker, that he intends to raise the UK feed in tariff for micro-CHP systems. The UK currently provides a feed in tariff for micro CHP (combined heat and power) products of 10 pence per kilowatt hour plus an additional 3 pence for every kilowatt hour of electricity exported to the grid. Mr Barker said he will also remove the 30,000 cap in the upcoming Phase 2 of the feed in tariff consultation, support the ambition to have 1 million units installed by 2020 and provide future regulatory measures to drive micro-CHP uptake. Ceramic Fuel Cells' BlueGen is the first and so far only fuel cell micro CHP product to receive certification under the Microgeneration Certification Scheme and be eligible for the feed in tariff. Australian Renewable Fuels anticipate biodiesel demand will increase enough for all of its plants to be at or near capacity by the end of 2012. Revenue in the December quarter was $14.3 million, enough to bump half year revenue to $16.1 million. The recent fire at the Largs Bay plant will reduce overall sales for at least the next four months. During that time the company will utilize the Barnawartha and Picton plants to provide as much continuity of supply as possible. ARW said it has continued to develop its export program and has been contracted to supply up to 4 million litres per month over the next three to four months, with further options for the next nine months. Domestically, major customer Shell has confirmed its contract volumes for the next two years with a minimum of 40 million litres per annum. This will support Shell's diesel program in NSW and Victoria. All options that matured on 18 December 2011 were converted, resulting in a cash injection of around $4 million in the month. Clean Seas Tuna's December quarter revenue was $7.0 million, bringing first half revenue to $14.4 million. The company said it is continuing to improve performance in its Kingfish grow-out operations to turn it into a profitable business with a reasonable return on capital. Kingfish grow-out operations contributed over $2 million of positive cash flow in the financial year to date, due to a reduction of inventory levels and continued improvement in Kingfish farmgate prices in domestic and export markets. Shares in Hydrotech International hit a one year low of 0.4 cents on 3 February. December quarter revenue was $541,000. The company said revenue continues to increase each quarter, and its cash burn rate is falling. However with $172,000 of cash at 31 December "it is clear the Group needs further funding and restructuring". Intec's 50/50 joint venture subsidiary, Intec International Projects Pty Ltd (IIP), has entered a contract and received an initial project commencement payment in Iran. This is for a comprehensive technology development and engineering program for its previously foreshadowed IRC project. "While certain details of the project remain confidential at this stage," Stage 1 of the project will use the Intec Process to process 25,000 tonnes per annum (tpa) of minerals waste. The waste has been stockpiled for over 20 years, with over 2 million tonnes awaiting a suitable environmental and economic processing technology. The IRC Project Stage 1 will produce up to 5,000 tpa of special high grade zinc metal and lead products, plus coproducts and by-products. If Stage 1 is successful, it is envisaged that Stage 2 will process up to 200,000 tpa of zinc/lead feedstock, which matches the current residue output. The estimated revenues for IIP's services and the provision of a technology licence over the course of the program are $6 million. The up-front payment of $1.4 million has been received by IIP for work already commenced, although much of this amount will be paid to third party contractors and sub-contractors. If the IRC Project achieves all milestones, Intec's estimated revenues for its direct services to IIP are about $2 million of the $6 million. The plant design project engineering, construction and commissioning is expected to take three years. "The IRC Project is potentially the first full-scale commercial application of the Intec Process for minerals processing, building upon previous small-scale commercial applications of the technology for waste recycling," said managing director Philip Wood. Mission NewEnergy is to restructure its operations and has commenced a detailed review in-light of its cash position and a significantly lower than expected 2011 Jatropha harvest. The company believes the low harvest is a result of historically planting wild seed varieties that have large yield variability in early years before the trees mature. Maturity should be achieved in the seventh year after planting and on average the current acreage is less than three years old. Management is re-evaluating its productive acreage and yield expectations, which are likely to materially down graded. No further plantings will be undertaken until the yield from existing acreage is determined. "Structural changes to the business are absolutely necessary in light of the current stage of development of the Jatropha operations. We continue to believe in the strength of our Jatropha business long term; however, given our current cash position the company needs to review all its strategic options," said Nathan Mahalingam, Group chief executive of Mission NewEnergy. Management believes the company has a viable refining business and that in the long term its Jatropha operations will be profitable. The restructure is to conserve cash and will likely include a reduction in operating expenditure on all fronts, divestment of non-core assets and raising further equity. Lynas Corporation's shares jumped 32 cents on news that Malaysia's Atomic Energy Licensing Board (AELB) has approved the temporary operating licence (TOL) for its Lynas Advanced Materials Plant (LAMP). The TOL or pre-operating licence is valid for two years. If Lynas complies with its requirements, a permanent operating licence may be issued within the two years. The AELB included several conditions for the TOL: that Lynas submit all details of a Permanent Disposal Facility (PDF) including location regardless of the outcome of research and development into commercialization, recycling and re-use of solid residue materials. The plans are to be submitted and approved within 10 months of the issue of the TOL, and Lynas is to pay US$50 million in instalments to the Malaysian Government as a financial guarantee. Shares in BluGlass fell to an all time low of 7.9 cents on 2 February. The all time high was 95.5 cents in March 2007. They have drifted downwards since. Carnegie Wave Energy has welcomed a new wave energy resource estimate from the US Department of Energy that estimates wave energy has the potential to supply 30 per cent of the country's power. Shares in Dyesol fell to a five year low of 22.5 cents on 25 January. The 20 cent shares listed in 2005 and rose to a peak of $2.35 in August 2007, but have drifted downwards since. To diversify its shareholder base and increase liquidity, Dyesol has upgraded from the Over-the-Counter (OTC) Pink marketplace in the US to the top tier of the OTC market - the OTCQX. "This move significantly increases information transparency to US investors by providing a full record of all company announcements, financial reports and shareholder notifications from the preceding 24 months and a vehicle for easy access to quotes, company announcements and other disclosures in real-time," said the company. "Increased investor interest in the US is being driven by American subsidiary Dyesol Inc's joint venture with Pilkington North America called Dyetec Solar, and by the mandate to incorporate .sustainability. and green investment options into a growing number of investment portfolios," said Dyesol chairman Richard Caldwell. Eco Quest's disappointment with the early commercialization of its bio-degradable nappies is no doubt in part due to its December quarter revenue of only $85,000. Half year revenue was $124,000. It remains to be seen how much these numbers improve. Shares in Eden Energy have fallen to a two year low of 3.5 cents. La Jolla Cove Investors has converted 619,195 shares at 3.23 cents each, raising US$20,790 for Eden. The works approval needed by Enerji from the WA Department of Environment and Conservation before works can commence on site in Carnarvon was scheduled to be issued on 3 February. Its issue means Enerji can commence on-site construction of its waste heat to power system including installation of Australia's first Opcon Powerbox. Installation of the Opcon Powerbox is scheduled between 14 to 16 February, with commissioning planned for March. (AX: ERJ). Greek Rock Energy shares fell to an all time low of 0.6 cents on 31 January. On the day the company announced that it intends to place up to 400 million shares at 0.5 cents each to raise up to $2 million. Tranche 1 was placed with sophisticated and institutional investors, raising $500,000 for working capital. Tranche 2 of a further $1.5 million needs shareholder approval at the general meeting in March. The placement is organized by Cygnet Capital. All capital raised by Cygnet Capital attracts a 6 per cent fee and will be $120,000 plus GST if the total $2 million is achieved. Cygnet Capital also receives 40 million options exercisable at 1.2 cents per share before 31 January 2015. Hot Rock and Energy Development Corporation (EDC), the world's largest steam and plant geothermal company, have now signed binding joint venture agreements covering four of Hot Rock's projects, two each in Chile and Peru. The agreements cover funding of each project up to financial close. On transfer of tenements to the project companies, Hot Rock will receive an initial US$2.5 million in cash and another US$1.5 million subject to conditions. EDC will acquire a 70 per cent interest in each project company and will sole fund the exploration stage up to US$12 million per project, making total expenditure of the four projects up to US$48 million. At the subsequent resource development stage, EDC with 70 per cent and Hot Rock with 30 per cent will fund each project on a pro-rata basis. HRL can contribute cash or request EDC to advance it a loan to fund evaluation and production drilling through to securing project finance for each project. The estimated cost of the evaluation stage for each project is in the order of US$38 million. KUTh Energy has won an exclusive concession from the Commonwealth Utilities Corporation (CUC) of Saipan to develop geothermal power and sell electricity. Saipan is an island in the Pacific. A grant from the Commonwealth of the Northern Marianas (CNMI) government for US$1.1 million will support the drilling of a 600 metre deep geothermal gradient well - Stage One of the Geothermal Gradient Project. Additional grant funding of US$0.5 million is available to support follow-on assessment work if warranted. Previous studies have identified potential volcanic geothermal targets and rate geothermal as high impact on CNMI's future power mix if resource can be identified. Current base load diesel generation is 30 MW and peak load 45 MW. There are compelling economics to replace diesel with geothermal base load power, said the company. Shares in MediVac hot an all time low of 0.12 cents on 1 February. Coal seam gas explorer Metgasco Metgasco says the results of a water study of its operations are very encouraging with a range of beneficial and economically attractive options identified. Metgasco's wells produce high quality and low volumes of water compared to other coal seam gas operations, giving it a wide range of options. Metgasco engaged Cardno to prepare an initial scoping of the options. Cardno has expertise in water resources, ecology, hydrodynamic modeling and environmental engineering.